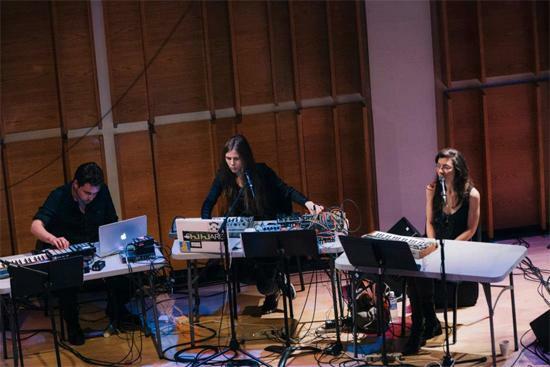 Last week, Stateside electronic and experimental artists Laurel Halo, Julia Holter and Daniel Wohl played a collaborative show in New York with the Transit new music ensemble. The performance, which was part of the city's Ecstatic Music Festival, was the result of several months' worth of meetings to compose music that involved both standard notation and elements of improvisation, with Transit's players responding to certain aural cues given by Halo, Holter and Wohl. Now New York radio station WXQR has made the audio of the full show - just under 70 minutes long - available for streaming. You can listen to it via the embed below. "The evening often unfolded as ambient clouds of sound that blurred the lines between composition and improvisation," says the show's blurb on the website. "Field recordings and the pointillistic entrances of Transit – a quartet of piano, violin, cello and percussion – colored the resonant vocals of Holter and Halo with expressive impact.